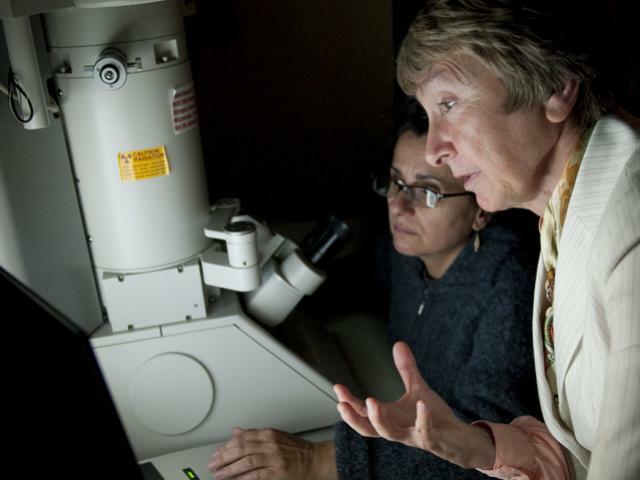 OARDC scientist Linda Saif (pictured, right) has received the 2015 Wolf Prize in Agriculture for her work on viral diseases of critical importance to farm animals, food safety and human health. A Distinguished University Professor in the Food Animal Health Research Program, Saif is the first woman and the first Ohio State scientist to receive the recognition, which the Wolf Foundation of Israel has given since 1978. In addition to agriculture, the Wolf Prize is given for achievement in the fields of chemistry, mathematics, medicine, physics and the arts. Past recipients include Stephen Hawking (in physics) and Jared Diamond (agriculture). To contact the scientist: Linda Saif at saif.2@osu.edu.